A severe storm made its way through Delaware this evening, dropping the temperature after a hot and humid day. A high of 93 in Georgetown broke a record. 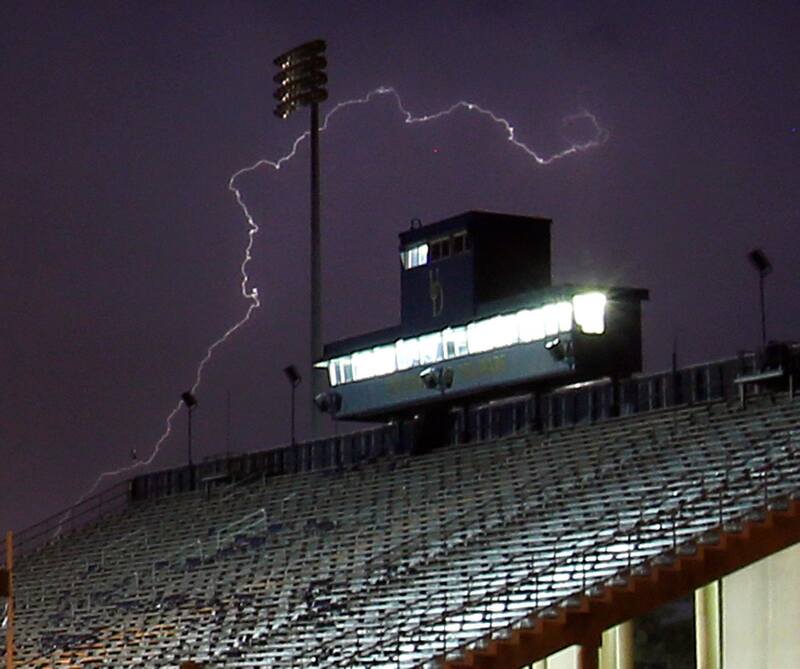 Here’s a photo by News Journal photographer William Bretzger of lightning striking at the UD football stadium. That game against DSU was postponed until tomorrow at noon. It’s funny but I still allow people to get under my skin a little bit. The sheer lunacy of some situations or conversations leave me shaking my head, wondering if people actually hear the words erupting from their mouths. Look at the photo to the right–this was the situation surrounding our entire area Saturday evening. The photo is of the press box on the West grandstand of Delaware Stadium. The storms began at approximately 5 PM and lasted…well, I’m not entirely sure since it was still going on when I went to bed around midnight. LOOK AT IT! The storms were training up the east coast as well as coming in from the west–a double hit. Just prior to the arrival of this massive storm front was what we, the average Joe, thought was an unformed funnel cloud, filled with dirt from the STAR campus, moving rapidly toward the south, just across the street from the stadium. When I witnessed this happening, unable to run (don’t ask), I actually quite calmly thought “Well Dorothy, it’s been a great ride but this journey is about to come to it’s final end.” Not kidding…I thought I was done for. The game was, of course, postponed until the next afternoon. Smartest decision ever made. I am sensitive enough to the time commitment my students make every year to know that there was no way on this earth they could drop their lives and show up on a Sunday with about 14 hours of notice. Marching Band is an academic class at UD, and the students sign a contract upon the start of each season. The contract commits them to the established calendar. This means they know when they are required to be in attendance and when they may schedule the rest of their lives: work, other ensemble rehearsals, and let’s not forget time to study. I knew when I made it a volunteer situation the band on Sunday would be small to say the very least. And small it was–about 40 members at the most. Yet we had a blast! Once we figured out what we could play and what we couldn’t play we got into a routine. All touchdowns and extra points were taken care of. Yes the brass “ran the stands” during third quarter. Yes, the woodwinds played Fight Song Short and Delaware Forever A when the team scored during the third quarter…with one lone tuba…they are now the newly formed UDMB String Band. And yes, I broke out the horn and played too. No, I did not run the stands…I sat with good friends, chatted, laughed and waited for the brass players to get around to the West stands in order to join them for the last “First Down” in front of sections A & B. …I would have been beaten had I tried to “run”….by many, many people from surgeons to students to general fans! Yes the University of Delaware won the game…yet again beating Delaware State University. Yes it was a beautiful day on Sunday and no, the stands were not full. Yes we all had a magnificent time. But for Heaven’s sake people…when Armageddon is breaking loose outside and places everyone in harm’s way, it is simply not safe for anyone to be outside, let alone play a football game! So when I hear people saying things like: “It wasn’t that bad out there.” or “I was so disappointed they postponed the game.” or “They had a chance to get the game in if they had started after it stopped raining at 6:15.” I have to wonder if you actually hear the words coming out of your mouth. This entry was posted in General, Uncategorized and tagged dignity, integrity, leadership, life lessons, marching band, reflection, respect, ud marching band, udmb. Bookmark the permalink.